Keep it simple. Keep it fresh. 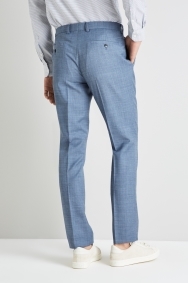 Whether you’re attending a party or a lavish wedding, these DKNY light blue trousers are your ideal wingman. 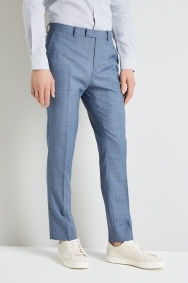 Crafted in a refreshing sky blue openweave material that makes them extra light and comfortable, their slim and tapered fit ensures you look on-point from morning to night. For a more casual look, tuck in a textured pastel shirt and wear your smartest canvas shoes. Got a really smart event? Go for the full 3-piece suit, a crisp, slim fit shirt, and a pair of polished tan brogues. Actual slim trousers are so hard to find these days. This pair looks and feels perfect. Excellent suit, perfect fit, very trendy! Perfect fit, comfortable to wear, and very breathable for summer month.